Did an envelope from the Boston Globe arrive in your mailbox this week? Or an email in your inbox? 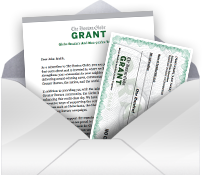 If you are a Boston Globe print or digital subscriber, you probably received a letter from the Globe about its generous GRANT (Globe Readers And Non-profits Together) program which supports local nonprofits. You can help Household Goods get free advertising in the Globe through their GRANT (Globe Readers and Nonprofits Together) program! 1. Visit the Globe GRANT website. 2. Enter your Boston Globe subscriber number. If you don’t know it, you can email grant@globe.com or call customer service at 1-888-694-5623. 3. Type in Household Goods as your favorite nonprofit from the list. Use Acton, MA in the City/State field. By designating us as your preferred nonprofit, you can help us spread the word about the vital work we are doing helping 2,500 families a year make a home. Last year we were #19 – can we do it again? Voting is open until April 30, 2017. Thank you for considering us!